Botana means "appetizer". But this dish is so much more! It makes a great meal when paired with a salad. And, it's delicious wrapped up in a tortilla. To save time, use a bag of frozen onions with peppers in place of fresh. If you don't have fresh garlic, garlic powder will work just as well. Add oil to a pan and set it at medium heat on the stove. Add onions, garlic, and bell pepper. Cook, stirring frequently, until veggies are soft and just starting to brown. Add spices, beans, and canned tomatoes with juices. Simmer mixture on low until thickened, about 15 minutes. Spray a 9x9 or 9x13 inch baking dish with cooking spray and spread cooked rice on the bottom. 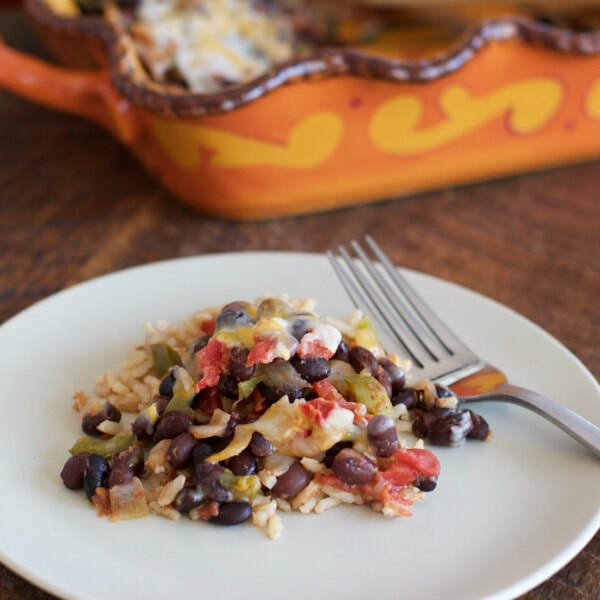 Cover rice with bean and vegetable mixture and sprinkle cheese on top.